GALION — Just when you thought it was safe to go outside — or to school — again, Mother Nature slapped Galion area residents back into reality once again. It’s been a week like no other in north central Ohio. Sub-zero temperatures and dangerous wind chills closed area schools and postponed school events Wednesday and Thursday. The temperature at 6 a.m. Friday was a balmy 9 degrees at 6 a.m., and most kids were prepared to get up and get ready for classes to resume. But snow overnight, ranging from 2 to 4 inches across the area meant no classes for Northmor, Colonel Crawford and Crestline students. Galion students had a two-hour delay. And to cap off one of the wackiest weeks of weather in recent history, the upcoming forecast from the National Weather Service is calling for temperatures near 50 on Sunday and Monday, which would be a swing of some 60 degrees in the span of about 80 hours. Unfortunately, that change in temperatures could result in more water main breaks in area communities. Which means more repairs and overtime costs for cities and villages. It’s also a perfect recipe for potholes, which will soon be appearing in your neighborhoods, township and county roads and state and interstate highways. If you’re looking ahead, temperatures will be above normal through much of next week, but by next weekend it will start to feel like winter again in north central Ohio. Still, togetherness was the word of the week as Galion area residents, who got the day off from work or school were stuck at home, and it was often too cold to go out and play. There was lots of bundling up in front of the fireplace, under electric blankets or in front of the TV for binge-watching, which is what Zaynah Tate, Crystal Trosper Payton and Kristi Chambers did. Lots of people — including Amanda Linette Fraizer, Jon Vitello and Bryce Lehman — stayed in and did chores: cleaning, laundry, golf ball sorting, running the sweeper and more. Maria Winemiller said she demoished some closets. Cindy Davis said she went through hundreds of pictures from old picture albums and sorted them. Brooke Lehman Speck was outdoors more than many of us. She delivered the mail: “I walked 10 miles, wearing ski goggles, and made sure everyone received their Bath and Body Works coupons,” she said. Mark Blum ventured outside, too. He took photos of the bluebirds in his back yard, who also were huddled together to stay warm. You can’t beat a day like that. 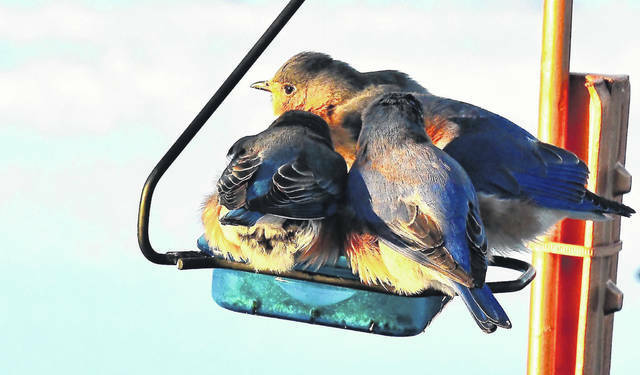 OGalion resident Mark Blum captured this picture of bluebirds huddled together on a feeder to keep warm during the Polar Vortex earlier this week. https://www.galioninquirer.com/wp-content/uploads/sites/38/2019/02/web1_51773029_1098062820378621_4581501482192338944_n.jpgOGalion resident Mark Blum captured this picture of bluebirds huddled together on a feeder to keep warm during the Polar Vortex earlier this week.